After 52 days away, the Arabian Gulf League returns on Monday. There will be no great fanfare when Dibba Al Fujairah and surprise-relegation-contenders Al Wasl kick-off the second half of the campaign. This is not, simply, because of a hangover from the Asian Cup. A tournament that ended in great disappointment on the pitch for the hosts. That excuse is too simple, too convenient. Instead, four weeks of transfer-market inactivity and high-profile defections among the 14 participants has added to the sense of a competition floundering in the regional fight for relevancy. That this downwards trend has continued at a time when the Saudi Professional League (SPL) has drafted in the likes of ex-Italy magician Sebastian Giovinco, plus long-term Jose Mourinho acolyte Rui Faria and Morocco centre-back Mehdi Benatia now call the Qatar Stars League home, only adds to the sense of futility. The desire to break even and establish fiscal responsibility in the AGL is admirable. This drive for austerity, however, appears to have chronically curbed not just ambitions, but also imaginations. A downwards trend was established in the summer when 2016 AFC Player of the Year Omar Abdulrahman, finally, bid farewell for the rapaciously ambitious SPL. Plus, only Al Nasr showed any kind of intent with the recruitment of former France midfielder Yohan Cabaye and ex-Spain striker Alvaro Negredo. The winter market was even worse. Club World Cup hero Zoran Mamic followed in Amoory’s footsteps by swapping AGL champions Al Ain for Al Hilal. The Boss also sold emerging Egypt midfielder Hussein El Shahat to Al Ahly and saw last month’s Silver Ball winner Caio agree a free transfer to Benfica this summer. There was also the inexplicable decision from Nasr to cut Cabaye loose after only six months. Nondescript Portuguese playmaker Ruben Ribeiro is in at Al Ain. Brazilian also-rans Samuel Rosa (Nasr to Fujairah) and Ronaldo Mendes (Fujairah to Wasl, loan cancellation) were also on the move. In other deals, Emirates Club, as per usual, raided the outer reaches. Nasr have welcomed back Lebanon centre-back Joan Oumari and allowed new coach Benat San Jose to be reunited with Chilean forward Ronnie Fernandez. All at a time when Giovinco, prolific Spanish striker Jonathan Soriano, Australia centre-back Milos Degenek, €10 million Romania winger Nicolae Stanciu, Faria and Benatia have begun to call the region home. There were no such blockbusters in the AGL. But this can be excused. What can’t is a lack of invention and creativity. To Al Ain’s credit, strong rumours state they’ve beaten Juventus, among others, to a summer deal for rising 18-year-old Iraq forward Mohanad Ali. Dibba Al Fujairah also landed Jordan forward Yousef Al Rawashdeh for their remaining 2018/19 commitments. These are exactly the kind of deal financially constricted clubs should be making. Ali was a breakout star at the Asian Cup. Al Rawashdeh got two assists in three tournament run-outs. Both impressed, both are affordably priced. India centre-back Sandesh Jhingan, Bahrain defender Hamad Al Shamsan, Thailand midfielder Thitipan Puangchan – since hoovered up by J1 League – and Oman forward Muhsen Al Ghassani would have fitted this criteria. Instead, an uninspired selection of journeymen pad out a depleted field in a jaded competition. Not even witnessing if Sharjah’s surprise title bid comes to fruition, or how legendary coach Henk ten Cate fares at Al Wahda, can deflect from this unfortunate conclusion. 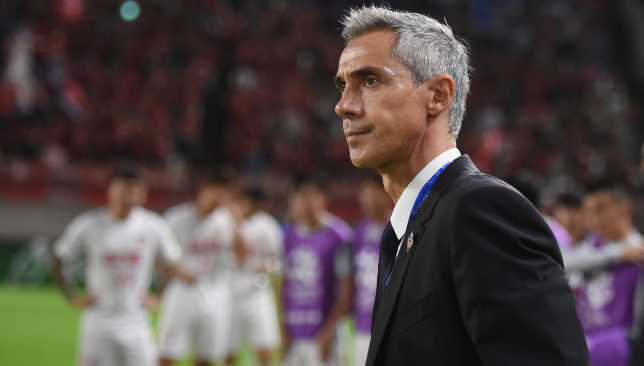 Portugal great Paulo Sousa has reportedly emerged as an early target for Al Ain after history making coach Zoran Mamic’s painful mid-season departure. Mamic, 47, thanked the Boss in a lengthy Twitter post for “the amazing memories we made together” and confirmed his wildly successful two-year tenure at Hazza bin Zayed Stadium had come to an abrupt end late on Tuesday, six months before his deal’s expiry. This followed several days of fevered speculation that he will imminently be appointed by Saudi Arabia giants Al Hilal, because of their ongoing failure to get Jorge Jesus to commit his future beyond June. The ex-Croatia defender, who Al Ain claimed on Wednesday was instead “taking some rest because of the pressures experienced through management”, was poached from Riyadh’s Al Nassr in February 2017. He would go on to secure a club-first Arabian Gulf League and President’s Cup double last May, plus heroically lead the Boss to a 4-1 defeat against Real Madrid in December’s Club World Cup showpiece in Abu Dhabi. Portuguese newspaper A Bola stated that Sousa, 48, “has a chance to train” the Garden City-outfit. The well-travelled ex-Juventus and Borussia Dortmund midfielder has been out of work since a mutual departure was negotiated with China’s Tianjin Quanjian in October, after less than a year in charge. August’s sale of influential Belgium centre midfielder Axel Witsel to BVB sparked a slide that saw Sousa oversee a potential relegation fight. Tianjin did, however, make the AFC Champions League quarter-finals under him. Sousa reportedly this week rejected the chance to succeed Aitor Karanka at the Championship’s Nottingham Forest. The suave tactician made his name at Queens Park Rangers, Swansea City and Leicester City at the turn of the decade. But he failed to gain promotion to the Premier League at all three, prior to embarking on a nomadic run of clubs. This period included winning trophies at Hungary’s Videoton and Switzerland’s Basel. If Sousa does come in at Al Ain, he’ll take over a side temporarily led by ex-Borussia Monchengladbach defender Zeljko Sopic and Ahmed Abdullah. In a boost for the Boss, they have successfully untangled the complex contractual situation of playmaker Ruben Ribeiro and registered him as replacement for Egypt’s Hussein El Shahat in their four-player foreign quota for the second half of the campaign. Ribeiro, 31, was one of seven Sporting Lisbon footballers to terminate his contract last June because of a training ground assault by ultras. But this status as a free agent was challenged by the Portuguese giants, preventing him playing in the CWC. The apparent breakthrough means he will slot in for El Shahat, following last month’s $5 million sale to Al Ahly. Al Ain’s record-breaking boss Zoran Mamic has entered detailed talks to takeover at Saudi giants Al Hilal after a terminal breakdown in the relationship with Jorge Jesus, putting their Arabian Gulf League title defence in serious jeopardy. Reverberations were sent through the Middle East late on Sunday night when Al Riyadh stated an ongoing failure to get celebrated ex-Benfica and Sporting Lisbon supremo Jesus to commit his future until November’s finale of the 2019 AFC Champions League, or ink an extension until 2022, had sparked a decision to imminently end his successful seven-month tenure. Further sources have confirmed an announcement about the 64-year-old’s departure is expected in the aftermath of Sunday’s Saudi Professional League outing at Al Feiha. Mamic, 47, is the chosen successor. He has worked wonders in the Garden City since he was controversially poached from Riyadh’s Al Nassr in February 2017, winning a club-first AGL and President’s Cup double in 2017/18 and then honourably losing 4-1 to Real Madrid in last month’s Club World Cup final. The ex-Croatia defender has less than six months remaining on his Al Ain deal. It will take a remarkable smoothing out of the fractured relationship between Jesus and Hilal to prevent his departure being confirmed in the coming week. Mamic revived a squad that had lost its lustre under compatriot Zlatko Dalic after the painful 2016 ACL final loss to South Korea’s Jeonbuk Hyundai Motors. He currently boasts a 56-per-cent win percentage, plus sees Al Ain sit three points behind shock top-flight leaders Sharjah at the halfway stage – with a game in hand. The Boss also remained loyal to Mamic in the wake of June 2018’s four-year prison sentence handed out in Croatia for his role in a multi-million-euro abuse of power and graft, related to his spell at Dinamo Zagreb as sporting director and head coach. He disputes the conviction. If Mamic does leave, it will continue a disruptive winter break. Influential Egypt midfielder Hussein El Shahat’s boyhood wish was granted with a $5 million move to Al Ahly. Brazilian forward Caio – named second-best player at the CWC – travelled to Portugal and was widely reported to have inked a free-transfer switch to Benfica upon the expiration of his contract in June. No replacement has been procured for El Shahat. Esperance de Tunis forward Anice Badri and Levante’s Emmanuel Boateng have been linked, without signing. This could see CWC specialist addition Tongo Doumbia, a Mali defensive midfielder, added to the four-player foreign quartet. Al Ain’s resumption in the AGL is penciled in for February 5, against relegation-battlers Emirates Club.